Even though I have not attended any Montessori schools in my life, I’m very interested in learning how the Montessori pedagogy can contribute to my juniors’ growth. I have tried several Montessori apps, and I feel that they have a positive impact on my juniors. Today I am reviewing a brand new Montessori app from Edoki Academy that I have been testing for more than a week now: Montessori 1st Operations. It’s an awesome math app that focuses on the key concepts of basic math operations: addition and subtraction. The app also lays the foundation for multiplication and division by introducing key concepts such as how to differentiate between odd and even numbers, and how to determine the halves and doubles of a number. Montessori 1st Operations has three levels of learning: key concepts, playbox, and tables. In the first level of learning, your juniors will learn the basics of addition, subtraction, odd/even numbers, and halves/doubles. They will start by learning how to add two numbers totalling 10 or less. Then, they continue with the concept of subtraction involving two numbers that are also 10 or less. Your juniors can then learn how to differentiate between odd and even numbers. They will see numbers from 1 to 10 on the top of the screen with placeholders for the associated number of beads underneath it. The beads are arranged in two columns; even numbers have equal number of beads on both columns, while odd numbers have an additional bead placed in the middle of the two columns at the last row. I personally find this an ingenious way to teach young juniors how to differentiate between odd and even numbers. I was surprised that my three-year-old son, Philip, was able to understand the concept relatively easily using this approach. Once juniors finish placing the beads, they can continue to the next activity: learning about halves and doubles. First, they learn that they can split each groups of beads by swiping upwards to create a line between the two columns. It was quite easy for Philip to understand that he couldn’t divide an odd number into two equal groups, because there was always one bead standing in the way of the dividing line. Through the use of animation and narration, the app clearly explains the concept of halves and doubles. For example, underneath the number 8, you can find four beads on each column. As soon as you draw the dividing line, the four beads on the left column will fall to the ground, leaving only the ones on the right column. The narrator will explain that half of eight is four. When the app duplicates the beads to refill the left column, the narrator will explain that the double of four is eight. Use red and blue beads to differentiate between numbers. Once your juniors are ready to practice the key concepts, they can start playing in the Playbox area. The addition and subtraction concepts have two games each: the monster game and the bubble game. In the monster game, your juniors are asked to solve simple addition/subtraction equations involving two numbers that will yield a total of 20 or less. The monster game uses red and blue beads to help your juniors count and determine the result of each equation. In the bubble game, your juniors will be asked to solve as many equations as possible in 60 seconds. For each equation, the app will show several bubbles with numbers in it. Your juniors are required to drag the bubble with the correct answer into the answer box. What makes this bubble game interesting is that the app continually adjusts its difficulty as you progress through the game and each time you replay it. This makes the game relevant even for older juniors and adults who are looking to sharpen their mental calculation skills. Once you’ve reached a certain level, the game will challenge you with equations involving three operands. To test if your juniors really understand how to different between odd and even numbers, the app offers a Bubble Popping game. You try to pop as many numbered bubbles that fit the current instruction. For example, pop 10 odd numbers, then 10 even numbers, and so on. There is also a similar game to practice your understanding of halves, in which you pop bubbles with even numbers in them into two smaller bubbles until they contain odd numbers. The final game is called the Smart Fingers, which can be played by up to two people. The game splits the screen into two and then generates an even number to indicate the number of fingers you should place on screen. The goal is to split your fingers evenly on both sides. For example, to represent the number 8, you should place four fingers on the left side and four on the right. This is another excellent way to practice halving an even number. The app provides learning addition and subtraction tables. In the last level, the app offers addition and subtraction tables. Juniors can tap any number in the table and see it broken down into the appropriate equation. For example, tapping a cell along the fourth row and the third column of the addition table will prompt the app to show the equation 4 + 3 = 7. I have to admit that even though I’m quite familiar with the addition table, this is the first time I’ve seen a subtraction table. However, I believe your juniors will easily master the subtraction table once they are familiar with the addition table. As the last activity in this learning period, your juniors can try to rebuild these tables by solving one equation at a time. This activity helps them to learn how to place the correct number in the intersection of each row and column. Montessori 1st Operations supports multiple user profiles and remembers each user’s individual progress. This, combined with the ability to set the app’s difficulty levels, allows you to personalize the app to suit different needs and learning rates. For this reason, I would say that the app can be used with a wider age range than the developer’s recommended range of 5-8 years old. The app also has a unique reward mechanism that uses points instead of the generally used stickers. You collect points every time you practice or play with the various games in the app. These points can be used to purchase more than 20 monster parts in the Monster Store menu. Once you have enough parts, you can go to the Monster Lab and construct your very own unique monster. I really like this app. I find it quite amazing that it provides enough content for years of learning. Plus, it allows multiple profiles, has adaptive game difficulties, and supports 11 languages. I’m not familiar with other languages, but I’ve tried switching to Chinese every once in a while and the narration is perfect. All in all, this is a terrific app to learn basic math concepts the Montessori way. 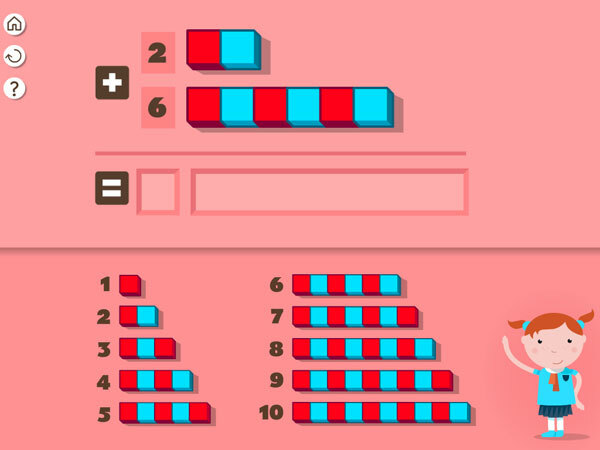 Count, Sort and Match.Develop basic math skills through colorful mini games.